Zoanthid coral, affectionately called zoas by aquarium hobbyists in online forums (I guess because zoanthid coral is too long to type) are an extremely popular type of coral kept in reef tanks. Because they are relatively easy to grow, maintain, frag, AND they are available in amazing, brilliant, fluorescent colors. There are three common types of zoanthids you will encounter in local fish stores and online–the three types are zoanthus, palythoa, and protopalythoa. One of the main distinctions between these three separate types of “zoa” is the degree to which each of the individual polyps is either attached to each other or not. The individual polyps of a palythoa are attached by a thick mat, called a stolon. If you’re not sure what a stolon is, the iconic example in the saltwater aquarium I can imagine is the green star polyp. Can you picture the purple mat that holds all the green polyps together? That is the stolon. Protopalythoa polyps are connected by a thin layer of tissue, called a coenenchyme, that is reinforced with bits of sand/sediment. Finally, proper zoanthids have the thinnest attachment which is typically not reinforced with sediment. The only reason you would want to know that is to impress your friends the next time you go to trivia night at a local establishment. Since this is an article about zoas, I figured it was worth clarifying. The majority of zoanthids have symbiotic photosynthetic zooxanthellae (I dare you to try and say that three times quickly) and are therefore best kept with at least moderate aquarium lighting. Some of the more brightly colored morphs will tolerate even intense lighting from metal halide or newer generation LED lights if acclimated properly. Most species are capable of actively capturing prey. For fastest growth of these corals, it is recommended that you feed them periodically with an appropriately sized food, although feeding is not usually required. Target feeding these zoanthid coral polyps is fairly straightforward, you simply place food particles that are the right size as close to the center of the polyp as you can. The polyps will fold inward, the mouth will open, and the food will go inside. 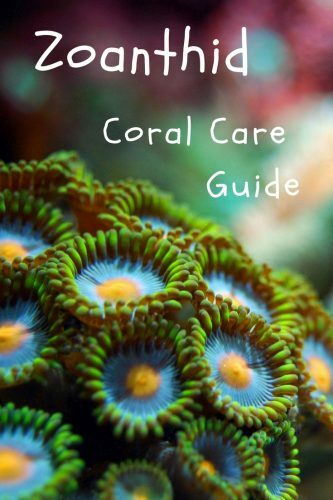 This is the fastest and best way to grow these corals. Don’t forget that corals are animals–and animals like to eat. Yes, they can and do get some of their energy from the symbiotic zooxanthellae that live inside their tissue, but that is only half of the story. You will be rewarded with strong growth if you feed them regularly. If your polyps won’t eat, try changing up the size and type of food you are offering. Borneman reported that some individuals would only respond to certain food prey items. Place zoa corals in an area of low-medium to medium-high flow. Too much flow may make it hard for the polyps to open. You will know your zoanthids are ‘happy’ if they open up and are fully extended without seeming to stretch so far upright. 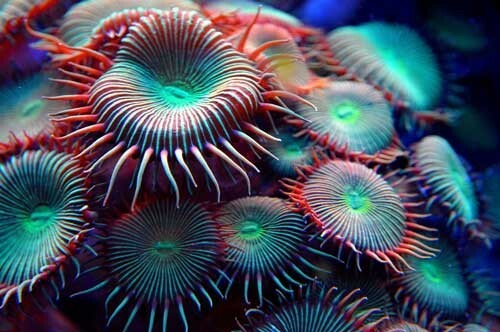 This is a generalization–and generalizations can be problematic in some specific instances, but look to the vibrancy of the color of the coral as an indication for how much light the coral needs (and therefore a reflection on where to place the coral in terms of proximity to the brightest lights). The more intense and fluorescent the color is, chances are good that means the more intense the lighting has been for that coral so far. The more dull, drab or darkly colored, the more shaded the zoanthid coral has likely been. The best case scenario, in terms of zoanthid placement, is to know how and where the coral was placed most recently (if it came from a fellow hobbyist tank, for example)–and if happily growing–try to recreate that in your tank. That is, of course, unless you know your placement will be that much better. Most zoanthids are rather forgiving/tolerant of different lighting and being placed just about anywhere but the most shaded or (opposite) brightest positions in the tank. Many of the most popular “name brand” zoas, like fruit loops, orange bam bam, fire and ice, and whammin’ watermelon have eye-popping colors that will pop best when placed under the actinic lights. You could place them higher in the water column, too, assuming you properly acclimate them to the light intensity, if you don’t have more light-hungry corals in your tank. 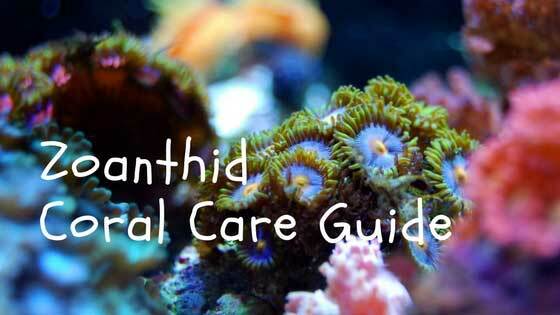 Zoanthids require the standard water parameters that are good for keeping just about any of your corals healthy. You’re aiming for tropical water temperature (about 78 F), normal ocean salinity (somewhere around 1.025 specific gravity), normal hardness (8-12 dKH) and a pH around 8-8.4. For more information about the most important reef tank aquarium water parameters, check out one of my most popular articles here. The key to keeping water parameters in the right range is to start with a high-quality salt mix. 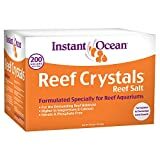 You can read a review of a few of the most popular salt mixes here. Some of the more rare and delicate zoanthids may take a couple of days to open up after transportation to your home. If you just bought your polyps, don’t worry if they won’t open up right away. However, if your polyps were previously open and have recently closed up, this should be taken as a serious sign of a water parameters issue. The first things I would check are salinity and pH. In my experience, zoas will close up if there are swings in salinity. I originally read about this in the book: Practical Coral Farming. You will find these for sale at any respectable local or online fish store. Prices will vary for just a few dollars ($5-10) for a small frag all the way up to the max you will want to pay for a high-end designer coral with a fancy name like Orange bam bam or purple hornet zoanthids, which can sell for $100 or more for every coral polyp. One of the most fun aspects of keeping zoos in your saltwater aquarium is to collect polyps from the hottest color morphs. They have ridiculous sounding names that seem to make perfect sense once you see them. If you’re just getting started, here is a list of some of the names you can start with to begin your search to find the perfect zoas for your reef tank. To see what some of these zoanthids look like, take a look at this eye-candy video with a ranking of the top 10 most popular zoanthids. 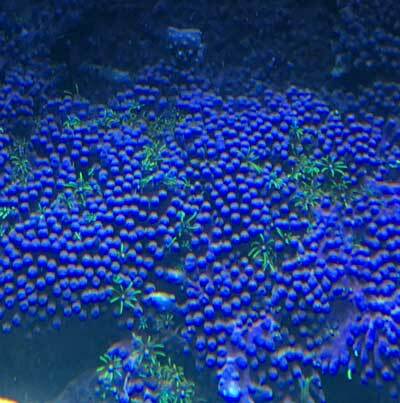 Over the last few years, there has been a bit of a zoanthids collector mania, driving up the prices of rare zoanthid color morphs. These rare zoanthids go by names like bubble buster, tazer, tyree space monster, and bloodshots. These corals are for the ultimate collectors with a lot of money, dreams of coral propagation and an I gotta have it gene. These corals are so expensive and so popular there are forum threads that discuss the street value of these corals. You can’t make that stuff up. Several species of polyps produce a toxic chemical, called palytoxin, and so individual specimens should be handled with extreme care. Palytoxin can cause neurological damage if it gets inside of a cut, your eyes or in your nose or mouth. Always wear protective gear when handling zoanthids, including gloves and goggles. Not every variety of zoanthid coral creates palytoxin, but be sure to let friends and family members know about it, just in case you ever run into an issue. A great way to do that is to document the issue in the back of your reef journal and to let your family know it is there. One disease that seems to disproportionately impacts these corals is something called zoa pox or zoanthid pox. 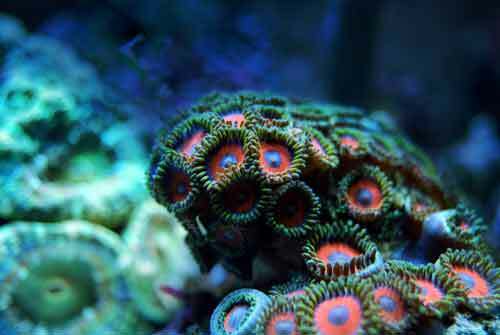 Zoa pox is the name given to the zoanthid disease characterized by tiny growths on the side of the affected zoas. I’m not sure whether the growths/pustules themselves irritate the polyps and cause them to close up, or if the coral is otherwise sickly and closed up (therefore showing the zoa pox), but the bottom line is that if you see zoa pox, you have a sick coral. How do you treat zoa pox? One thread suggests hobbyists have been successful using Furan-2, which suggests zoa pox may be bacterial in nature (because Furan-2 is an antibiotic). Another common problem with keeping zoas is predation–sometimes the culprit is that someone has been eating your zoanthids. Look for issues like parasites or fish eating your zoanthids. If you are interested in hardy, fast-growing, brightly colored corals (and who isn’t?) then there is probably a perfect zoanthid for you. Be sure to wear protective gear and always wash your hands when handling them and most of all, take pictures and enjoy. Thanks for your guide. We’re just a few months into our saltwater foray. Zoas are definitely the coral I’ve fallen in love with. I did find this good article on indicators for identifying the species or varieties that are likely to be the most poisonous. 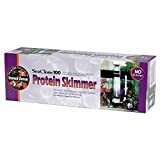 G Becker, thanks for the great comment and the addition of that link. Very helpful.